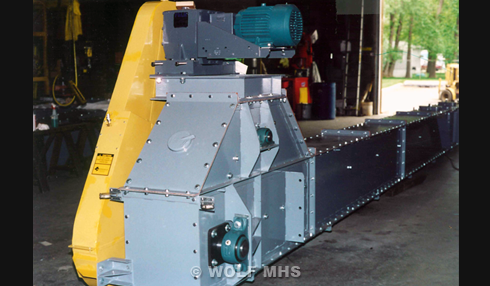 Wolf MHS designs and manufactures drag conveyors with a “complete system” approach. Because of this the drag conveyors are designed to provide long life with minimum maintenance. The drag conveyors are designed to run at a relatively slow speed with heavy wear plates that are easily replaceable. The enclosed gravity take-up design allows Wolf to easily make the conveyor air & gas tight.